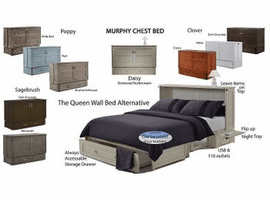 The MURPHY BED also sold as the wall bed, cabinet bed, credenza bed, bed in a box, guest bed.
. 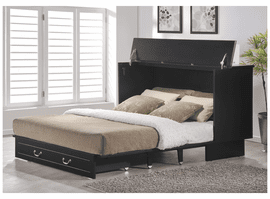 In just seconds, the attractive, compact cabinet opens and extends into a comfy queen-size bed. This is the perfect sleeping solution for studio apartments, vacation condos, or in any small room that serves as a guest room. Gain extra valuable living space when the bed is folded away in the cabinet! Some models are also available in Full Size & Twin Size.